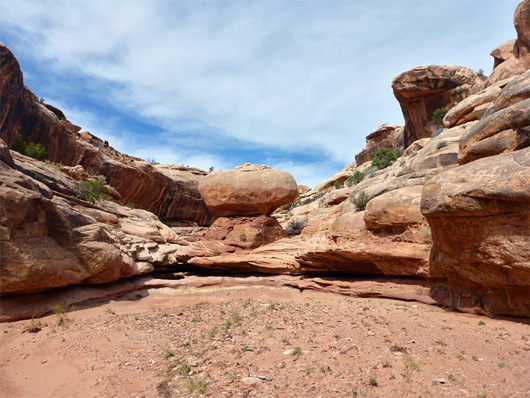 Steer Gulch is the westernmost drainage of Cedar Mesa, running for over 15 miles below the Red House Cliffs, crossing treeless, relatively low elevation terrain before meeting the San Juan River. The lower end, far from any road, forms deep, cliff-bound narrows, but the majority of the drainage is very shallow and not interesting, the other exception being a 3 mile section towards the upper end, which is also enclosed by cliffs, of up to 150 feet, and contains several short, slot-like passageways, together with many seasonal pools, big boulders and patches of fluted slickrock. Unlike the deeper canyons to the east there are no ancient ruins or rock art panels in Steer Gulch however the scenery is pleasant enough and the canyon is easily accessed, directly from Hwy 261, the lightly traveled road to Halls Crossing. 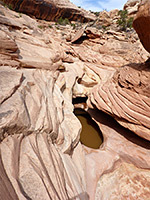 All of the enclosed upper section of the canyon can be seen on an eight mile loop hike, returning along the western fork, which also has a couple of narrow sections with permanent pools. Although quite long, the hike is easy enough since the few obstructions are all straightforward to bypass, and the gradients are gentle. 18 views of Steer Gulch. Hwy 261 is a very scenic road, descending steadily from the pinyon-juniper high country along the northern edge of Cedar Mesa, near Natural Bridges National Monument, down 1,500 feet to a desert-like plateau of red earth and exposed rock, sparsely covered with small bushes. The views extend a long way south, towards Navajo Mountain and the buttes of Monument Valley. Parking for the Steer Gulch hike is on the verge after 12.3 miles, opposite a faint vehicle track, close to where the highway crosses a small dry wash, the upper end of the west fork. The old track heads southeast, crossing a patch of slickrock in the north fork, and after half mile approaches a small, stony hill, on the far side which is the main canyon, here about 100 feet deep; near the northern end of its enclosed section. 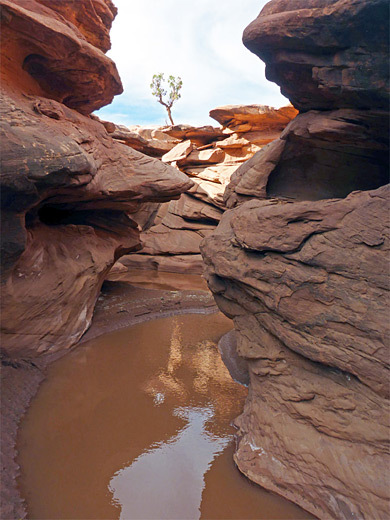 Some parts of the walls are sheer, but there are places to climb-down a little way south, descending to the streambed just above a rocky patch where the seasonal floods have eroded a swirling channel through the light-colored, thin-layered sandstone bedrock. The canyon is quite wide, mostly free of vegetation, and remains so all the way, as it heads south, round a few bends while staying straight overall. The cliffs become less steep for a while, and further apart, up to another nice section with a rippled rock floor and fluted channels, just downstream of a taller, overhanging, desert varnish-streaked cliff on the right, and leading to a drop-off and pools. 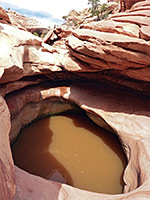 A little further is a bigger pour-off beneath a balanced boulder, with a deep pothole below, soon followed by a tributary on the right, meeting the streambed at a smaller dryfall. Cattle prints in the mud below indicate there are no more obstructions downstream, and the cliffs fade away completely in another mile or so. 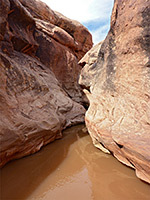 A larger tributary, 0.7 miles below the small one is the west fork, which ends in a short but quite deep watery slot containing pools, patches of sticky mud and several drop-offs, bypassed by climbing up the inside of the confluence and returning to the streambed just above the narrows. 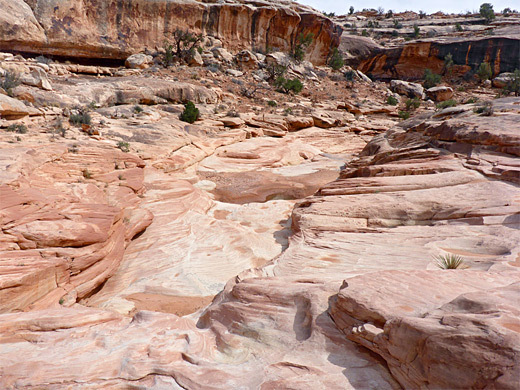 Beyond, the drainage quickly transitions to a rocky wash rather than a canyon but deepens again after nearly a mile, just after a west-side tributary. 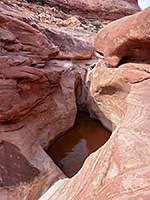 The enclosed part extends another 1.5 miles with no features of note, until a pretty dryfall into a slot, also containing pools, lined by more angular, protruding rocks. This slot is passable by scrambling up the layered cliffs to the west, starting a little way back, and once above, the drainage is very shallow again, and meets the highway in another 1.3 miles.